A couple of weeks ago, a friend from work had her leaving do … (very sad face). But it gave me the opportunity to bake her a cake (hooray!) and celebrate along with her! Although at first, I wasn’t sure what flavour to pick, I knew she liked chocolate orange which left only one choice in my mind. 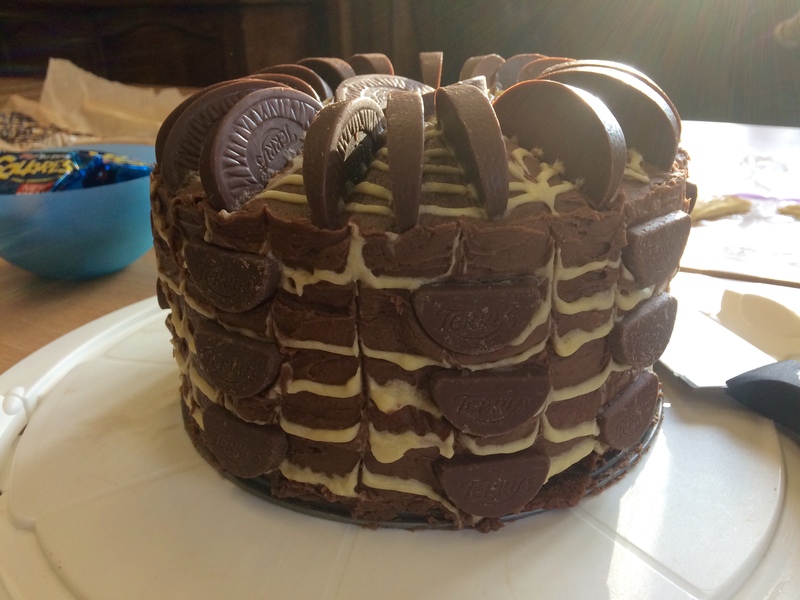 Triple layer chocolate orange cake. 50 grams dark chocolate, heated in a microwave at 20 second intervals until melted. 1 bag of Mini Terry’s Chocolate Orange pieces. I also made a small batch of vanilla butter icing for decoration. This will need an extra 75 gr. butter, softened, 175 gr icing sugar, 1 tsp. of vanilla sugar or extract and whisk all together. You may need some extra milk to loosen the mixture. For this cake you will need 3 x 20cm round cake tins. Grease and line each tin with baking paper. I grease my tins with butter (on the bottom and side of the tin) and only place baking paper in the bottom of the tin. In a large bowl, cream together the butter and sugar until light and fluffy. For large cakes like this, I use a hand mixer. Add around a third of the flour and egg and whisk until incorporated. Whisk in the rest of the eggs. Fold in the rest of the flour and cocoa powder. Zest the orange and add to the mixture. Place the Terry’s Chocolate Orange in the microwaveable bowl and microwave for 20 seconds at a time until just melted, stirring in-between each 20 seconds. Add the melted chocolate to the cake mixture and stir through until mixed thoroughly. You should have a dropping consistency at this point, but if you don’t, you can either squeeze in some of the orange or add some milk. Place a third of the mixture into one of the 20 cm round baking tins and repeat for the other two tins. I weigh the mixture into the tins in order to get a similar amount in each tin. Place the tins in the oven for 20 – 25 minutes until you can stick a fork in it and it comes out clean. Once the cakes are out of the oven, leave to rest for at least 5 minutes. With a rubber spatula or something similar, go round the edges to loosen any cake that has stuck. Place the cakes onto a cooling rack and leave to cool. To make the chocolate butter icing, soften the butter with a knife or fork. Add the icing, cocoa and chocolate and stir/whisk until it has blended together to make a spreading consistency. If the mixture is too hard, I sometimes add milk to loosen slightly, but just be careful not to add too much. To build up the layers of the cake, take the first layer and spread the chocolate butter icing over the top and around the sides of the cake. Next add the next layer and repeat the process and do the same with the final layer. I find smoothing icing around the side very difficult. I use a cake decorating turntable and a large palate knife to help with this.